Looks like I'm becoming the reset queen ;) Resetting my character and pokemon, keeping my money, candies and items. My new starter will be a Lv 5 Male Qwilfish. Doing a complete reset of my character profile and roster. Keeping my items. Choosing a Lv.5 Rockruff (F) as my starter. I am resetting, my old account is here. Obtaining a New Starter and a Starter Pack. New starter is a Stunky with EG Crunch. Will be moving to a new account Skunkaru. I would like to keep all of my old pokemon and items, not changing or dropping anything please. In preparation for wanting to return and play in FB, I am making a full reset. I'm just not feeling what I had previously done anymore, its sort of like returning to something you were writing a year ago and expecting to continue to have the drive to write it. I'm not Stephen King. All of my Pokemon (so my one) will be let go. She can go in the AC, she deserves it. Level 5 Female Woobat. Gonna throw everything into the aether except Pokedollars because I believe I cannot do that. Picking up a starter pack and my new starter will be a Level 5 Inkay. Last edited by Emi; 07-05-2018 at 10:50 AM. Documentation of Reset: Trainer #0134, "Tate". Keeping my Swirlix and Comfey. The following pokemon go to the AC for Reversion Care. Keeping Items, Cash, and Candies. Choosing a Level 5 Male Togepi with EM Nasty Plot as my new starter. Last edited by Lil'twick; 08-26-2018 at 10:19 PM. Turns back the clock, for better or worse. Going back to the fork she once blew by. Revealing feet and hands today. She wears the cone-like hat as a suit. And waits for the day when someday she'll grow. Devolving my level 42 female Glalie into Snorunt, and deleting the moves Freeze-Dry and Sheer Cold that it only gets in the Glalie stage. Devolving my lvl 33 Croconaw into a Totodile! He loses no moves in the process. Devolving my Lv 44 Drapion to a Skorupi. She loses Fire Fang, Thunder Fang and Ice Fang that are exclusive to Drapion. I've over complicated my current narrative so I'm resetting, the following Pokemon, including my current starter, are being dropped and I'm requesting Maintenance Care from the Adoption Centre. I'll be keeping all of my items and all my other Pokemon (for now at least). He'd had enough. As much as he loved helping his father as he sort to achieve his dream, he had dreams of his own. He was already 16, most of his friends had already gone off on their own adventures, travelling through different regions, making new friends and finding new Pokemon. It wasn't that he didn't want to go, it was more that he felt obligated to help his father. He'd been helping his father raise and train his Pokemon to a high standard, he'd learnt all the skills he needed to become an elite Pokemon trainer, the only issue was he didn't have a Pokemon of his own. Alexander left home early, it was rare that he woke before his father, but this morning he didn't want to be interrupted. It was a good hour hike to the nearest town, through thick woodland, filled with Pokemon. He knew it was risky travelling alone and without a Pokemon to defend himself, but it had to be done. If all went well, he wouldn't be returning alone, once he had a Pokemon of his own he'd finally be able to head off on an adventure of his own. The sun was still hidden behind the trees, his destination was due east, easy enough to find in the morning. Alexander broke into a steady jog, he had to get there early. He'd met the local professor a couple of times before, he was young compared to most, shy and a bit of a recluse, he rarely left the lab. In his father's line of work, he'd seen a wide variety of Pokemon growing up, but none caught his eye as much as the Starter Pokemon. Water, Fire and Grass typed, Starter Pokemon were often a common sight in Gyms. Most beginning Pokemon trainers received one, their options limited by the region they start in. They'd lived in pretty much every region at some point, but recently they'd moved to Fizzytopia as his father pursued his ultimate goal. Whether the professor even kept any Starter Pokemon was unknown to him, but it was worth a shot. Alexander stumbled backwards. He knew how fast a Scolipede could move, he wasn't outrunning it. He knew he wasn't going to be able to scare it off, he knew he had no Pokemon to defend himself with. He was royally screwed. As he prepared for the unavoidable crushing, the Scolipede was surprisingly struck from behind by a powerful torrent of water. The faint glow of the morning sun filtering through the leaves was reflected by the steel trim of the Empoleon. This was no stranger, he'd known this Empoleon since it was a hatchling Piplup. He'd helped his father raise it, of all his father's Pokemon, it was Empoleon that he respected the most. The Water type had trained tirelessly, but never failed to put others before itself. It must have seen him leave and followed him to make sure he was safe. Alexander breathed a sigh of relief, thank Arceus he had. The Scolipede glared at the Empoleon, it was too early in the morning for a fight. The Bug type retreated, much to Alexander's relief. "Thanks Empoleon" he spouted, "I don't think I could have handled him myself." He chuckled awkwardly, he probably would have died. "We're almost at town, mind following me the rest of the way?" He took it as a yes. The forest quickly fell away, giving way to a small town. There were no more than twenty houses, twenty one if you included the lab on the far side of the town. He weaved his way through the houses, most of the residents were still sleeping, although a couple were already walking the streets. He soon reached the lab and began to beat his fist on the door. "Professor! ", he shouted, "Professor Pine, are you awake?!" This carried on for about two minutes, before a still half asleep man in a lab coat answered the door. "I am now", he yawns and stretches the sleep from his body. "Alexander isn't it? I remember you, you're father is the one training to be a Steel Gym Leader isn't he?" He was surprised the Professor remembered him, but his father had said the man's mind was like a steel trap. "You can just call me Xander, but yes, that's me." "Is everything alright? Does your father require my assistance again?" "Actually, I'm here on business of my own, I want to start my own journey, I want my own Pokemon." He'd gotten straight to the point, he'd waited too long to dance around it. "Oh uh, I guess you better come in then", the Professor invited him inside. The lab was full of advanced equipment, as well as an extensive library filled with enough books on Pokemon to keep a normal man busy for a lifetime. "I'll get us a coffee, take a seat." Xander made his way to a couple of nearby lounge chairs, settling down while the Professor brewed some coffee. 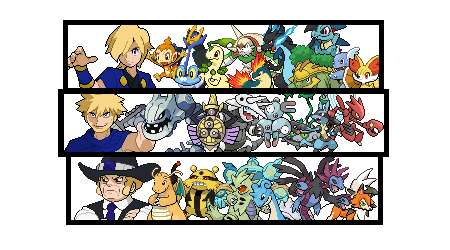 Empoleon had joined him as well, the Water type now stood behind him, as he so often did. The Professor soon returned, handing him a cup of coffee that he sipped at to gauge the temperature. "It's a shame you weren't here a month ago Xander. I had two local trainers head off, each received a Starter Pokemon from me. One chose a rather stoic little Bulbasaur, the other took a valiant little Oshawott. You could have had a bit more of a choice then, now I'm afraid I only have one Pokemon left. The others weren't too keen on him and after looking after him for a month, I kind of understand why. The little fella is boisterous to say the least, he is a really handful. He has a bit of temper if he doesn't get his way and I even think he feels a little neglected after not getting picked by the other trainers." The Professor produced a Pokeball and a Pokedex. "These are yours if you want them, I'd advise you keep that Empoleon close by, things could get a little heated." Xander had taken in nothing after the Professor had said he still had one Pokemon left. That's all he cared about, he didn't care how big of a problem it was going to be, at least it would be his problem. "I'll take it, I'll take it!" Xander happily accepted the Pokeball and Pokedex, then, without a second though, he released the Pokemon from inside the ball. The Professor was too slow to stop him, but it was clear that this was his intention. The fireball emerges as the ball opens and a young Chimchar begins to leap around the room. He was beginning to understand why the Professor was hesitant. Despite its erratic behaviour, Xander was filled with a sense of overwhelming joy. A Chimchar! He was often envious of the trainers he saw with Chimchar in the Sinnoh region, it was certainly one of his favourite Starter Pokemon. He now had a Pokemon of his own, now all he had to do was tell his father he was leaving. Why did it seem like he'd only done the easy part so far? He couldn't afford to put it off, he had to head home now. "Thanks for everything Professor, I'll be sure to call you if I need anything. Alright Chimchar, return!" He held up the Pokeball, firing the beam of light at the still hyper active Chimchar. It missed. He tried again. Missed. Again. Missed. Was this going to be a regular thing? "Oh right, have fun with that, you'll have a hard time recalling him unless he is tired", the Professor chuckled. Xander groaned, this was going to an issue. "Come on Chimchar, we're going", he called. The Chimchar looked at him for a moment, but didn't follow. Xander continued towards the door, Empoleon alongside him. As his hand grabbed the handle, he felt something land on his back, followed by a rather intense heat. Turning his head, he found the Chimchar perched on his shoulder. "Ahhh so you want to come outside do you? Well you'll get to spend plenty of time outside, as long as your with me that is. Sound alright to you?" "Alright then, let's get going!" He opened the door with renewed vigour. A quick trip home, a certainly heartfelt conversation with his dad and he'd be off and adventuring. Devolving my Lv 39 Zoroark back into Zorua for now. Forgets Night Daze, Night Slash, Imprison, U-Turn.